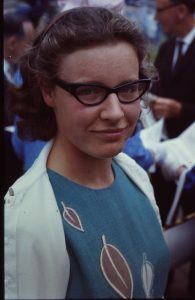 Jocelyn Bell Burnell¬†is a Northern Irish astrophysicist who has been credited with one of the greatest astronomical discoveries of the 20th century. As a PhD student she played a key role in the discovery of the first pulsars. Pulsars are the signals released from rapidly spinning neutron stars. Neutron stars are collapsed stars that are too small to form black holes. When she first found them, the radio pulses were so regular that she thought someone had to be making them on purpose, perhaps from another civilisation ‚Äì they affectionately called them ‚ÄòLittle Green Men signals‚Äô! You can read the story of her discovery, in her own words. Her PhD supervisor later won the Nobel Prize for Physics for this discovery. Many¬†people believe Burnell was unfairly ignored, but she speaks about it with good grace. Quite a few years ago I was lucky enough to hear her talk at the Royal Academy in London. She was spellbinding, delivering an inspirational and accessible astrophysics lecture, ‚ÄòWe are made of Stardust‚Äô, which described in detailed how the atoms in our bodies came from the death of stars. She spoke humbly about her accomplishments and had a real enthusiasm and passion for her subject which came across extraordinarily well. Dame Jocelyn is a trailblazer! She was the first female president of the Institute of Physics and has workxed throughout her career to promote girls and women in STEM. As such,¬†Dame Jocelyn Bell Burnell is a STEM super star!